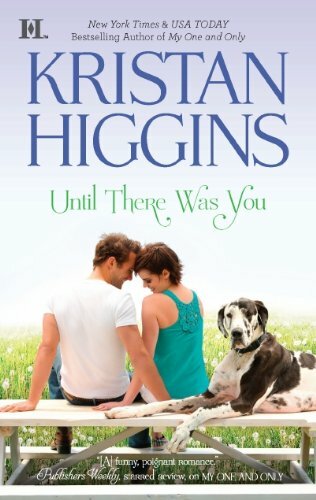 I was able to read Until There Was You by Kristan Higgins through NetGalley. I read and reviewed Just One of the Guys a couple of months ago and that made me more curious about the author’s other books. Also, bloggers are comparing Kristan Higgins to my two favorite contemporary romance authors, Jennifer Crusie and Julie James. I’ve been reading more fantasy novels lately and I decided to pick this one up to cleanse the reading palate. Posey Osterhagen can’t complain. She owns a successful architectural salvaging company, she’s surrounded by her loveable, if off-center, family and she has a boyfriend — sort of. Still, something’s missing. Something tall, brooding and criminally good-looking… something like Liam Murphy. Well, that was a lot of fun. Posey (real name: Cordelia) is the kind of girl I’d like to be friends with, everything about her is quirky. She owns an architectural salvaging company, which others refer to as a junk shop. She’s surrounded by an interesting set of secondary characters – her overprotective German parents, her brother and his outgoing husband and so many others. She lives in a church that has been converted into a house and even has its own belfry. She has an unusual fashion sense, her girliest attire consists of a dress that doesn’t really compliment her boyish figure, paired with engineer boots. She eats like a construction worker and doesn’t gain weight. Wouldn’t you want to hang out with someone like that? Posey doesn’t have a perfect life though. The first scene of the novel involves her reunion with her high school crush, bad-boy-turned-devoted-father Liam Murphy. He’s back in town with his teenage daughter and has no idea that he broke Posey’s heart when they were younger. I enjoyed the slow build up of the romance between these two. Sure, Posey has never gotten over Liam but it takes a while for him to realize that he’s attracted to her. So they get to know each other better, develop a friendship and move on to something more. I liked the banter between the two main characters and there’s a lot of humor included in the book, which is something that I always appreciate. I liked this one more than Just One of the Guys, probably because the point of view shifts from Posey to Liam so we get both sides of the story. Like I said, there are a lot of secondary characters in this one and Posey and Liam’s interactions with them lets readers see more of their personalities. I’m starting to notice that Kristan Higgins isn’t afraid to put her heroines in embarrassing situations and that’s what makes it so easy to relate to them. It’s entertaining to read about how they overcome their insecurities and how they go through hilarious situations as they work on relationships with the men in their lives. And they all love dogs! Check out the covers for her books, they all feature a couple with a dog beside them. I’m definitely going to pick up her other books the next time I want to read something light and fun or when I need to squeeze in a contemporary read in between my fantasy books. Until There Was You will be released on October 25. I could totally be friends with Posey too (gag, Cordelia? That’s an awful name, although it sounds terribly close to mine!). LOL I think Capillya is a lot better that Cordelia! I’ve already told you this, but I love your name. I’m glad you gave this a try seeing how you didn’t love Just One of the Guys. I was talking to Angie the other day and she said that of Kristan Higgins books (and she’s read her entire backlsit), Just One was her least favorite. Lol, so you could only go up from there. I’m reading All I Ever Wanted right now and it’s been fun. It’s so great to have a back-up contemporary romance author when you need a pick-me-up in between other reads. Angie has read Kristan Higgins’ entire backlist? Wow, that must be a good sign. Good to know that Just One was her least favorite because that makes me more curious about the author’s other novels. I’m planning to read All I Ever Wanted the next time I need a contemporary pick-me-up. I look forward to seeing what you think of that book! It really is great that Kristan Higgins has joined Julie James and Jennifer Crusie in my contemporary romance pile. So yeah. JUST ONE is my least favorite by far. Would never re-read it. I enjoyed all the others more. But the most memorable for me are definitely ALL I EVER WANTED and UNTIL THERE WAS YOU (definite re-reads), then there’s CATCH OF THE DAY and TOO GOOD TO BE TRUE (probable re-reads). Third tier (lol) would be NEXT BEST THING, FOOLS RUSH IN, and MY ONE AND ONLY (enjoyed at the time but won’t pick up again). All I Ever Wanted is next on my list! I’m going to read that the next time I want a Kristan Higgins fix. Until There Was You is really a lot better than Just One of the Guys for me so I see where you’re coming from. Thanks for the feedback! I’ll probably follow your recommendation when it comes to what I should pick up next. Fool’s Rush In, is that book where the heroine gets with her ex-brother in law who’s son is her sister’s kid as well? Yeah, that book didn’t sit well with me as all of the family sharing thing was a bit much for me. I really like Kristan Higgins, she’s a great author. I’ve read all of her books except Just One of the Guys. For some reason, I just can’t read that book. When I pick it up, I’m not in the mood to read it so I always put it down. I can’t remember if that’s the one but it sounds like a book that I won’t enjoy reading. I don’t like it when characters change romantic partners like they’re playing musical chairs. I enjoyed reading Just One of the Guys and I remember laughing out loud at some of the scenes there. I’m going to read All I Ever Wanted the next time I want a Kristan Higgins novel.